I read that article a couple days ago. Lots of cool info. Can't wait for it to open. I'd love to read it but that freakin website is making me sign up and pay $1 a week to read one article... anyone know a way around that? I am not having the same trouble. A while back I couldn't access Sacbee.com and switched browsers and was then able to access it. For this article I am using Firefox. Might be your AdBlocker...either whitelist wired.com or switch to another browser/incognito mode. Basically, some publishers are trying to fight back against ad blockers as those tools threaten their primary source of revenue (ads), so this is one way they're doing it. Clear your cookies or, as Glenn mentioned, try a different browser. I was able to read the article with no difficulty. It was adblocker for me. The article says that the arena electronics will be upgraded all the time and that is the reference to Teska. I think because our owners are software geniuses, the arena wbll always be the best in electronics and user friendliness. These guys have pride. We have moved from an era where our owner climbs to the ceiling to fix a leak to a world where our owners will make it easiest to take a leak. This is all very exciting for a nerd like me. Now let's get a team that wins. We have moved from an era where our owner climbs to the ceiling to fix a leak to a world where our owners will make it easiest to take a leak. Yep... I'm jealous. Can't wait to see the new digs for real. Looks amazing! Hey, Gnome! So if you come out for a Pacers game next season, I'm gonna try my best to make it down for the game. I can't wait to see this bad boy in person! Most probably opening night will be the first time. And then, if I have me a nice paying job by then, I'll make weekend trips throughout the season to watch em play. Keeping my fingers crossed; please do the same for me!!!!! wow. at least potentially. Making the old "bad seat in the house" question obsolete and irrelevant. I was part of a tour group a couple of weeks ago and was very impressed. 10,000 seats downstairs and 7,000 upstairs, instead of vice versa, makes a lot of sense. Having adequate space on the concourse will be great. The training facility looks great too. Really looking forward to seeing a game there. I left wondering if there's some way we could use the delta breeze to bother opponents' free throws. First visit to Golden 1 Center was a mind blower!!! Fantastic experience, really big/bigger arena bowl, way wider walkway around the arena at food court level all provided by local restaurants. Beer is $10/$13 for all brews offered and there were a ton of choices. Sampled couple food items all really good. Seats are a joy, fully cushioned bottom and back! Entry was strictly by iPhone using an electronic ticket in the wallet generated by Ticketmaster. Electronic ticket readers at every door make the task zip quick. Returned home with my GPS on and find out Arena is exactly 500 miles door to door to my place in Palm Springs. Big secret for us out-of-towners is the Vagabond Motel being only 2 blocks from the Arena and for the ladies, Macy's is actually across the street from the arena. All in all a wonderful experience. Both partially subsidized by the public? Able to attend both games, thank you wifey. The arena is friggin amazing. beautiful. The sight lines are awesome. We were in sec 204 row M for opening night. It's a tad tight up there but I was at the game, who cares! I spent most of my time watching the game from the sierra nevada draught house. Good beer, great people, GOOD TIMES! Last nights game we sat in a suite, again, thank you to the wife. I can't even begin to say how nice the staff is up there. I felt like royalty. The whole suite and loft area is off limits to anyone without a ticket. There is a sitting room and a large bar area that is just for suite ticket holders. The suite itself is very nice. The suite seats in front of the suite are all padded, like the front row seats. The food was a lot different from the food at the suites at Arco. Lots of cheese, olives, crackers, honey, all the beer, soda, and water you can drink, typical suite perks. The whole arena experience is just awesome. Agree.. Love the arena as well.. The way it was made the "newness" of the arena is not going to wear off for a very long time. It's so open that anything can be done to upgrade it and there would still be room for everything else. Great place to catch a game! Dim lights + G1C's steep upper bowl = several wrongful death lawsuits waiting to happen. This just made me sad. My cousins were at the Kanye west concert last night. They told me that After Kanye walked off the stage after only playing 2 songs the crowds were so angry they started looting and graffiti-ing up the bathrooms. Breaking mirrors and just causing mayhem. I can't believe people from here would do this to our beautiful new arena. Getting my 1st chance to see the arena tonight by going to the college double header ith sac st v uc Davis and then sd st vs cal. Splurged and sitting in kings row. Can't wait to see the arena and some good college ball. I wouldn't go to one of his concerts if you paid me. Heck, even Kanye couldn't wait to get out of his concert! Last night was opening day for March Madness and Sacramento is basking in all of Golden 1's glory. My buddy and I didn't have tickets but rode our bikes downtown and Ill tell you guys, downtown was packed. Packed full of people having a grand ol time. We were there at tip off of the UCLA game and we rode up from G1 all the way to Firestone and Deveers (the bagpipe and drum corp standing outside was outstanding!) on 16th. People were everywhere. Every business was packed. Even Subway! There was at least one cop on every street corner, talking with fans and giving directions. I did not see one bum. We walked up 16th past University of beers and all the other bars and restaurants that were all packed, all the way to Rst and iron horse, which of course was packed. My buddy who has been a skeptic of ANTHING getting done in sacramento since he put down a rather large deposit on the never built twin 51 story towers project was in awe over the sheer number of people walking around downtown. As we stood across from Malt and Mash, which is across the street from G1, we were commenting on the sushi house and the delicatessen with their accompanying condos, which will open up by next season across from G1. We were both picturing what K st will look like once all the planned businesses and condos have been built and occupied. It looked great last night but will be incredible once everything is done. I had my doubts about G1 being able to liven up downtown. Im a life long sacramentan and I know how hopeless our downtown situation has been. Ive seen how many times the efforts to develop the downtown rail yards have failed. I really had no hope that an arena could kick this city in the a$$ and force us to finally grow up and mature into anything other than a predominantly govt town. Last night made me so happy. It made me happy to see so many people from other cities being able to come to sacramento and enjoy what we have to offer. Enjoy our hospitality. My god, this city has arrived! is SOLD OUT here at Golden 1 Center! We can't wait for tip off! @fansinceday1 Nice read! Thanks for sharing. 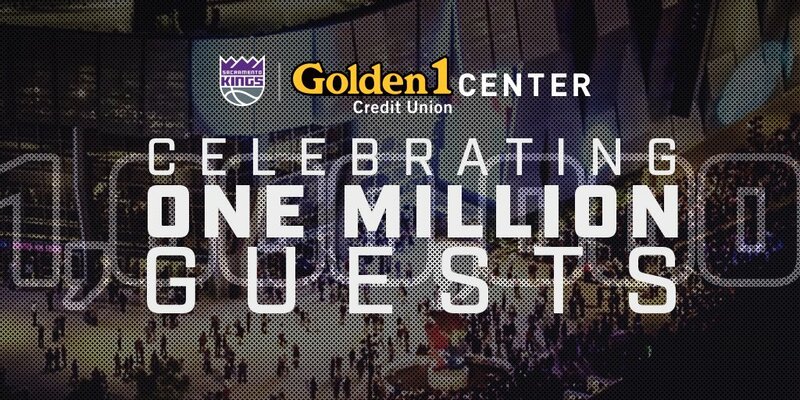 We just reached another milestone at Golden 1 Center!